Cut strips of cheese and lightly fry bacon. Let bacon cool until you can touch it. Split a hot dog half-way through and place cheese strips in groove. Wrap a slice of bacon around the hot dog and push a toothpick through to hold it closed. Place on pan in broiler, or cook over hot coals until bacon is crispy and hot dog cooked. 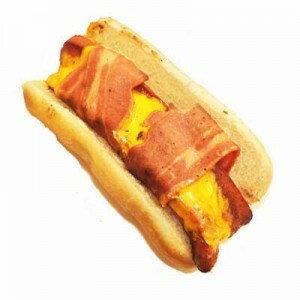 Cheese will drip off, so make sure you pre-cook bacon enough before wrapping it around hot dog and cheese.